the gardiner's dirt: Weak Stomach Warning! When I was pregnant with my second baby and right after I had her, people would always say things like, "Wait til you have the second. You won't care then." Or, "You won't be near as nervous (picky) about the next baby. Just wait." Regardless if these things are true or not (which they are) I hated hearing them and I try my hardest not to torture pregnant ladies with the same comments. With that said, yes, I have been way less protective, picky, and careful with Mae. Usually when I find her chewing on something I just casually take it out of her mouth and don't think anything about where it has been and if it is going to kill her. We were just chillin in the den when I made a bathroom trip. I came back into the room and naturally her jaw was in motion, chewing on something she shouldn't be. What is a good mother to do? You know that I do not want to touch the nasty thing, but I also do not want my precious baby to go to town on it. Even though she looked like the little creature wasn't even bothering her. So, I swallow hard, sweep it out, and whip it into the trash hoping that I haven't missed any body parts. Then I do the I-can't-believe-that-just-happened dance. You know the one. Where you shake all over, make a nasty face, and jump up and down a little. I'm hoping that is the last of Mr Roach and his little friends. I haven't seen any since so maybe Mae scared them all away with her fierce bite. That is probably one of the grossest things I've heard of a baby eating! AGH! is right! I don't know if I could have stomached that myself- you know though I've heard that people eat spiders occasionally in their sleep- guess if that's true, we're tougher than we think! Hi Hayley, this is Candy. I saw your blog on Annie's page and took a look. OK, seriously that is so gross! I would be doing the I-can't-belive-I-just-did-that dance for a whole week! Ew! Ew! 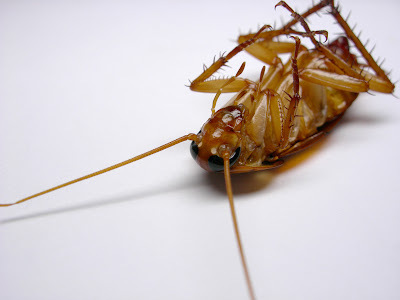 I don't even know if I've ever seen a real cockroach, I know I'm lucky. Good job to you! You are brave! But....hey....sorry about your kid, man. Start grooming her now for reality shows and she'll make you rich one day... just by eating cockroaches. *cringe* ugh...thats totally super nasty. that dance sounds familiar. So.. when i was a baby living in phoenix arizona my mom said the same thing happened to me and it's a story she's been telling all 26 years of my life. i guess i've been totally embarrassed to talk about it 'cause I can't think of a grosser insect to eat, but i guess now that Greta has done it I feel better. Thanks Mae! Oh my gosh! You win the award for the worst "my baby sticks everything in her mouth" experience. That is pretty gross, but she probably isn't the first kid to eat a bug and definitely won't be that last. Hope that is reassuring. Maybe she will be the kid that everyone dares to eat stuff...that would be cool! i'm not sure what's worse. the story or picture. sicko. Uh ... GROSS!!!! Maybe they are one of those bugs that are actually rich in nutrients and Mae was just trying to open your mind to new things. A lot of cultures do eat these things. I have no idea why. No matter what, starving, lost for weeks or months, I still would never be hungry enough to say, "hmm.... why not!"